Taste test: The texture of these potato chips varied a lot of from chip to chip. The first few that I grabbed were crunchy and very crisp, a really great texture. Some of the other chips were even crunchier but less crisp, and some of our tasters were complaining that the crunch was too hard. There was a good spicy taste at first, not specifically jalapeno, but still tasty and hot, and there was a good delayed jalapeno aftertaste. 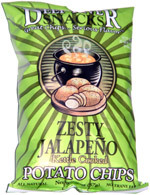 The crunchier chips seemed to have more jalapeno taste. Smell test: An OK jalapeno smell, but not that intense and no real heat. 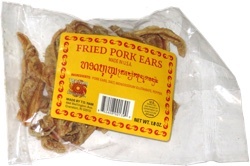 This snack was discovered by Keith at Broadway Market, 1709 Broadway, NYC. Review published .